If you’ve attended a Torah class or read any articles about the Parsha or Gemara you’ve probably heard someone reference the famous Rashi. The 11th century French Rabbi’s comments on the text are recorded in virtually every modern Torah, Talmud, and Tanach. And for years I just assumed Rashi was just one of many commentaries who happened to be the most popular. That is, until I came to Israel and found out Rashi is much, much more. The first thing Rabbi Gershenfeld pointed out in his class, is that he refused to refer to Rashi as a commentator. But instead, as a Pirush. What does that mean and how does that differ from commentary? When we speak about commentary, it’s from the outside in. Someone has their perspective that they are offering to make sense of or add to the text. But the concept of pirush is very different. The word pirush is spelled פרש, which shares the same shoresh (root letters) as the word fruit, פר. What is the essence of fruit? A tree takes its nutrients from the ground through its roots, grows tall in the trunk, all breathes with the leaves, all to produce that fruit. The primary purpose of the tree is to produce the fruit. So too, with the Torah, the insights that Rashi draws out are the real understandings of the Torah. Pretty bold statement considering how little we spend on Rashi’s notes. If you go through the Torah in English, you rarely notice it. But if you’re able to go through the text in the Hebrew there are glaring textual errors virtually on every page. Grammar inconsistencies, redundant language, odd tenses, etc. One of the biggest arguments that God didn’t write the Torah are these inconsistencies. But Rashi not only comes along to solve these problems, he gives over some of the most profound wisdom of the Torah. But simply reading Rashi’s words isn’t enough to do it. So how do we get there? Rabbi Girshenfeld outlined 4 essential steps. 1) Find the problem word. Simple enough it would seem… if you’re reading the text in Hebrew. If not, you’ll need a Torah that explicitly points them out (see picture). 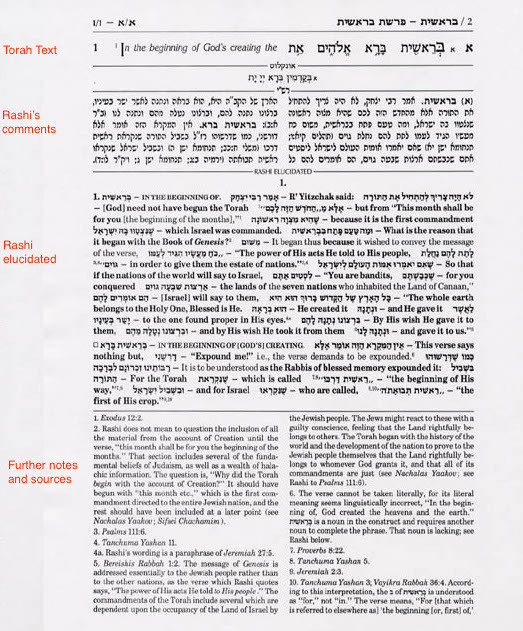 If you’re using something like Artscroll’s Stone Chumash, it may give you insights and credit it to Rashi, but it won’t necessarily identify the problem words. 2) How does Rashi resolve it? What’s odd about this? Normally when there’s a commandment given, the line usually sounds like “God says to Moses X commandment and Moses tells the Jewish people.” Why here does it outline the heads of the tribes? What does Rashi say? I’m just going to summarize it, but if you want the full comments go here. Rashi outlines that when God gives a commandment, the standard procedure is that God tells Moses, Moses tells Aaron, then the heads of the tribes, then the rest of Bnei Yisrael. We know this from Shemos 34:31-32. If that’s the case, why is the whole process mentioned so here where elsewhere it’s abbreviated? To learn out that if one makes a vow (what the following lines speak of) an authoritative Torah scholar can nullify that vow. 3) Does his answer make sense? Many times Rashi’s answers will feel cut and dry or simple. Sometimes they’ll seem verbose when you think you’ve gotten the point after the first sentence. The real question is, do you really understand what he’s saying? For this, you need careful reading of the context and often times commentaries on the Rashi. 4) How does this change my life? This is where the real work and reward happen. Great, so if I make a vow, some Rabbi can nullify it. Whoopty-do. Why should I care about that? I don’t really make vows and I haven’t gotten into the habit of breaking them. And even if it did am I really going to bother with trying to find a Rav to let me off the hook? But if I take the time to analyze what is being said here, I can come to a whole new dimension of understanding. What is the nature of a vow? Take God’s name (that’s what a vow is, swearing on God’s name) and give it so much power to it that I create a new mitzvah for myself. Then to realize that the Torah seems to be breaking its own format to give me a clue that the way to undo it is in this special way… it’s as if breaking a vow seems to break the natural order of the Torah. How do I really regard the name of God? How strongly do I regard my own word? What is the nature of my relationship with a Rav? How strong are my commitments? It’s from this final step that it all comes together. When we come across these inconsistencies they should bother us and we should ruminate on them. The way a piece of sand irritates an oyster until it becomes a pearl. These irritations in the text are there to germinate into pearls of wisdom. Rashi is just helping us get there.